[b]Has anybody noticed the amount of natural disasters and world problems this year? These are just the first couple of weeks from the start of 2011, there are now many more disasters to add to this already too long list! Are we heading for 2012 as predicted??? From Mayans long count calendar to Hindu's end of Kulki (Kalyug) including the Hopi tribe, the Bible, along with Nostradamus all seem to have the same belief that the world will end in 2012. Modern science searches for answers to these predictions. Simultaneous Terrestrial and Solar polar reversal in 2012 accompanied by recent tectonic movement as well as harmonic tremor in the area shows high probability of a mega volcano in 2012. There is lots of evidence pointing towards 2012 doomsday, religious and scientific, but what do you think on this topic? The shifting of the planet's northern magnetic pole forced Tampa International Airport to readjust their runways on Thursday, according to a report by Jeremy A. Kaplan of Foxnews.com. Kaplan reports that the shifting of the Earth's magnetic fields, spurred by the drifting of the north pole towards Russia, has prompted officials at the Florida airport to shut down their primary runway until January 13. The temporary closure will give them time to change their taxiway signs to account for the magnetic changes, Federal Aviation Administration (FAA) officials told Fox News. 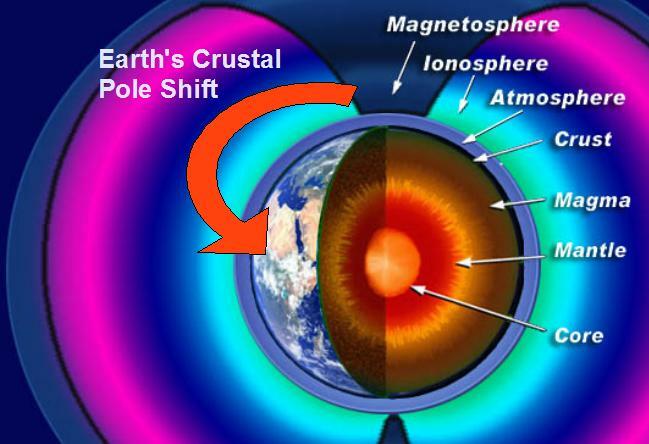 "The poles are generated by movements within the Earth's inner and outer cores, though the exact process isn't exactly understood. They're also constantly in flux, moving a few degrees every year, but the changes are almost never of such a magnitude that runways require adjusting," Kaplan reported, citing FAA spokesman Paul Takemoto as a source. The runway's listing on aviation charts will be changed from 18R/36L (representing 180-degree approach from the north and the 360-degree approach from the south) to 19R/1L, according to various media sources. When Kaplan asked Takemoto how often these kinds of adjustments were needed at airports, the FAA spokesman told him, "It happens so infrequently that they wouldn't venture a guess… In fact, you're the first journalist to ever ask me about it." He was also quick to point out that passenger safety will not be an issue, but that the changes were needed "to make sure the precision is there that we need." The Federal Aviation Administration required the runway designation change to account for what a National Geographic News report described as a gradual shift of the Earth's magnetic pole at nearly 40 miles a year toward Russia because of magnetic changes in the core of the planet." National Geographic recently reported new findings proving the pole to be moving at a rapid 40km per year towards Russia. It's speed has increased greatly over the last few years. Could this be the reason for an increase in natural disasters? or mass animal deaths, specifically birds? How much further will it move? Thank you very much for the pixs and nice information all neatly laid out,victoria1 You're cool! I still have not found the way to get the images to appear. You did it within a few posts. TheWatcher wrote: Thank you very much for the pixs and nice information all neatly laid out,victoria1 You're cool! I still have not found the way to get the images to appear. You did it within a few posts. still struggling with the pictures. ok here it is. Find the picture you want to post then right click it. Then click copy image url. Then when you come back here and post your topic click this= on your toolbar above where your typing, Right click again and click paste. click ok and that's it. Thanks,Admin,How 2 do it from my pc file? click choose file Then find the picture you want on your hard drive and click open. Then click upload now. When it's done you will have a list of codes. The one you want is the second code down.= IMG Code for Forums & Message Boards right click and copy this code. button and paste the code from tinypic then click ok..